Our new Hand Truck Curb Ramp is the perfect solution for product delivery. This co-polymer high impact plastic curb ramp can withstand the impact of up to 650 lbs. It is incredibly strong and durable and features a diamond tread, non-skid surface that keeps the ramp in place. 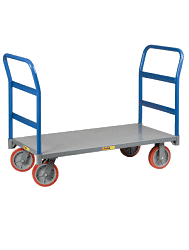 The Hand Truck Curb Ramp hangs on most hand trucks, helps prevent lower back injuries and will lower workers compensation claims for your company. These Curb Ramps have increased driver satisfaction for alot of route delivery drivers (the average beverage delivery person delivers an average of 9750 pounds per day). The dimensions are 21.5" wide x 23.5" long x 6" high, weighs 7 lbs.